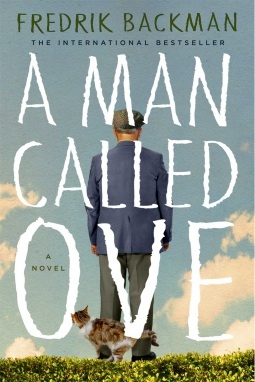 If you’ve followed my blog for long you know I have loved all of Fredrik Backman’s books, beginning with A Man Called Ove. 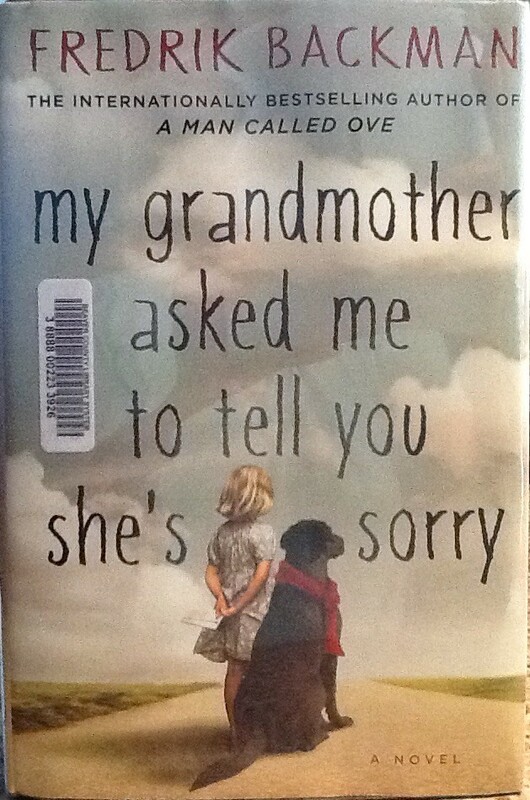 My Grandmother Asked Me to Tell You She’s Sorry was a little slow with a strange make believe between two of the main characters and I almost gave up on it. Let me tell you, NEVER give up on a Backman book! Always, always by the time you finish it’s wonderful and the story stays with you. No one writes characters quite like him. Beartown is another wonderful story. Hockey is a huge part of the story, I’m not into hockey so at first it was a little slow for me. But, I know a treasure is coming, so I keep reading. I have to say, several days after I finished the book it seems even sweeter. Does that ever happen to you? A story about moral failure, the dangers of crowd mentality, and coming of age, but mostly about the fragility of human nature . Set in Sweden, the incredible imagery puts you there in this small Swedish town in love with hockey. I loved it! If you are honest people may deceive you. Be honest anyway. If you are kind, people may accuse you of selfishness. Be kind anyway. All the good you do today will be forgotten by others tomorrow. Do good anyway. The final lines his mother wrote on the sheet of paper on his wall read as follows: What you create, others can destroy. Create anyway. Because in the end, it is between you and God. It was never between you and anyone else anyway. Another one: “David is at home, lying on his kitchen floor. He’s thirty-two years old and his red hair is so unruly it looks like it’s trying to escape from his head. He got teased about it when he was little; the other kids pretended to burn themselves on him in class. That was where he learned to fight. He didn’t have any friends, which was why he was able to devote all his time to hockey. He never bothered to acquire any other interests, which is how he’s managed to become the best. I love the description of David’s hair! And mother Kira and daughter Maya… Teenage years offer a brief period of equality after childhood, before the balance shifts and Kira become old enough to worry about her parents more than they do about her. soon Maya won’t be Kira’s little girl anymore, and then Kira will be come Maya’s little old mom. It doesn’t take a lot to be able to let go of your child. It takes everything. Read a little about Fredrik Backman HERE. A very touching novella about losing a loved one to dementia. Having gone through that with my mom it was a little hard for me to read. But as always, Mr. Backman left you with a wonderful uplifting feeling. A beautiful story of love and loss. This gem is available for purchase Tuesday, November 1, 2016. Thanks to Atria Books for surprising me with a copy to preview. Fredrik Backman is one of my favorite authors. Looking forward to his next novel, Beartown, coming out next spring! Another wonderful tale from Fredrik Backman! 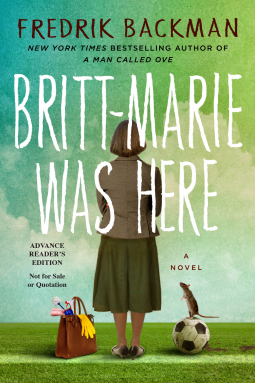 Britt-Marie was a minor character in My Grandmother Asked Me to Tell You She’s Sorry and got front and center in this book. She is a wonderful character! Backman’s characters are quite quirky, but he nails human nature on the head. The only thing I didn’t care for in this book was Mr. Backman had to make the seemingly obligatory nod to homosexuality/bisexuality. I’m really tired of that. It was only briefly mentioned and not explored in the character at all or any kind of an integral part of the story. It showed up for what it is ‘political correctness’ or whatever you call it. Disappointed at that. A Backman book is like receiving a gift, a real gem. If you haven’t read one yet, WHAT ARE YOU WAITING FOR? I received this book through Netgalley in exchange for my honest opinion! I am so looking forward to this! I adored the first two Backman books. Britt-Marie is a character from My Grandmother Asked Me to Tell You She’s Sorry. May 2016, mark your calendars. “Granny’s been telling these fairy tales for as long as Elsa can remember. In the beginning, they were only to make Elsa go to sleep, and to get her to practice Granny’s secret language, and a little because Granny is just about as nutty as a granny should be. But lately the stories have another dimension as well. Something Elsa can’t quite put her finger on.” A story about life and death and one of the most important human rights, the right to be different. Just like his first book A Man Called Ove this is a gem! At first I was having a hard time because of the fantasy/fairy tales that took up so much of the story. I don’t like that genre. But Granny is a story teller and as the book progressed I could see where this make believe land was an integral part of the larger picture and was laying the foundation. I never know how much to tell about the story, as I don’t want to spoil it unfolding for you as you read. I wish now I had paid more attention to the tales as I read the first half of this book! I really should go back and read it over. If you love fantasy and make-believe kingdoms then you’ll REALLY love this heartwarming tale told through the eyes of almost eight year old Elsa. Fredrik Backman knows how to write characters. He pegs human nature to a tee and finds redeeming qualities in even the ‘horrible’ characters. He has a gift for taking a group of misfits and turning them into a family full of love. I hope he never gives up writing! Elsa is just full of wisdom for her age. And Granny for all her oddity! I’m just going to share some quotes from the book with you to whet your appetite! This is Granny’s motto: ‘all seven year olds deserve superheroes. * Elsa see the quality in everyone that makes them a superhero! ‘The police car skids into the street, but Sam is long gone by then. Elsa collapses into the snow as if her clothes have been emptied of whatever was in there. She feels Alf catching her and hears him hissing at the wurse to run up the stairs before the police catch sight of it. She hears Britt-Marie panting and the police crunching through the snow. But her consciousness is already fading, far away. She’s ashamed of being so afraid that she just closes her eyes and escapes into her mind. No knight of Miamas was ever so paralyzed with fear. A real knight would have stayed in position, straight-backed, not taken refuge in sleep. But she can’t help it. It’s too much reality for an almost eight year old. She wakes up on the bed in Granny’s bedroom. It’s warm. She feels the wurse’ nose against her shoulder and pats it’s head. “You’re so brave,” she whispers. Read this book and A Man Called Ove if you haven’t. You won’t be sorry! On the house hunting front not so good. We’ve looked at 6 so far and one (the one with the tree house and the horses behind) is to die for, but the yard and the drive are not good for accommodating the travel trailer. Darn! I want that house! Can’t talk Bossman into selling it though :=) Another one is a nice little brick one, really laid out nice and gorgeous 1950’s kitchen, but…no back yard all front and near an industrial park and lots road noise. So we keep looking. 4 to look at today. This might take more than one trip down! But on the bright side, the local library is having their annual book sale this weekend! Yea! We’ve had lovely weather. Sunny and near or at 80 each day. The mountains and the people are lovely. We have a sweet young gal for a realtor and I really like her. Other than the terrible wifi service the campground we are at is great. Right on the Nolichucky River. We go to sleep to the sound of the rushing water! Saturday we are moving to a different camp close to Warrior Path State Park. Maybe my wifi connection will be better and I can post easier. Hope your having a great week! ‘In this bestselling and delightfully quirky debut novel from Sweden, a grumpy yet loveable man finds his solitary world turned on its head when a boisterous young family moves in next door. Quirky character got me interested in this book. And Ove is quirky! And I absolutely loved him! Ove is pronounced ‘uu’-ve the uu sounds like the u in rule and the ve like vay. I looked it up! Go here and hear it pronounced, click on the little blue triangle. The writing is wonderful, the characters excellent. I felt like I knew the whole neighborhood by the end of the book and I hated it to end. I hate to give too much away, but Ove is trying to commit suicide throughout the whole book and he is constantly interrupted, by his neighbors whom he really wants nothing to do with, and a stray cat that seems to have adopted him. Such a serious matter and yet so very funny. I laughed out loud, a lot. Lots of tender moments to that bring you to tears. “On the other hand he tried to point out to her that she shouldn’t give money to the beggars in the street, as they’d only buy schnapps with it. But she kept doing it. “They can do what they like with the money,’ she said. A beautiful, funny tale of loss, love and reconciliation. I hope you get a chance to read it and fall in love with Ove too. We can all learn a lot from him.